It would take multiples of more than ten fingers and ten toes to count the number of questions I’ve received asking me to explain the differences between "dipole," "bipole," and Axiom’s "quadpole" surround speakers. And many of those queries referred to the "rear" channels. So let’s first correct that all-too-common misconception about the surround channels. 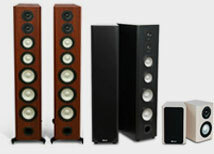 Much of the A/V industry and many retailers have mistakenly come to refer to the surround speakers as "rear" channels—it's convenient, and consumers get it more easily—but in fact Dolby Labs specify that surround speakers should be mounted on the side walls, to each side of the listening area, up higher, above the level of seated listeners, just like they are in the Dolby movie theaters. In cinemas, there are typically four or more direct-radiating surround speakers along each side wall, with a couple on the back wall as well. All these surround speakers are used for movie soundtrack directional and ambient effects that immerse the listener in a believable re-creation of the events and place that are happening on-screen in a given scene. Whether it’s crickets in a summer evening, a storm on the ocean, or the sounds of artillery around the soldiers in a war movie, the output of the surround channels is an essential ingredient to the movie experience in either a theater or a domestic living room. Axiom QS8 Quadpolar Surround Speakers, pictured above in Mansfield Beech with Light Gold Grilles. But in most living rooms or family rooms, the room dimensions are a tiny fraction of those of a commercial movie theater, and we don’t have the space (or the budget) to line our walls with multiple surrounds. Enter the dipole, bipole, and quadpole surround speakers. To mimic the acoustic delays that occur in a big space, with a big wash of reflected sound bouncing around the auditorium, designers applied the dipole principle to domestic surround speakers, using two or more drivers in a wall-mounted enclosure firing towards the front and rear of the room. 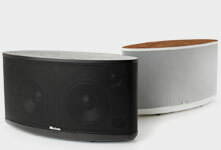 Indeed THX Lucasfilm endorsed their use in all domestic installations of THX speaker systems. However, in demonstrations of dipole surrounds, I’ve always detected a weird kind of "phasey" effect that induces in me a sense that speakers are out of phase; it may be peculiar to me (I doubt it) but I prefer multidirectional surrounds that don’t use dipole configurations. Other manufacturers picked up on this and produced "bipolar" surrounds, or some combination thereof, where the front and rear bass waves are in phase, and fire forward and to the rear, so a similar (but not identical) wash of atmospheric sounds is created. And there is no bass cancellation or null area like that produced by a dipole surround, but to the listener’s ears, the effects are very similar. Axiom’s founder and designer Ian Colquhoun decided to elaborate even further on the dipole/bipole surround concept, producing a "quadpole" design. He placed woofers firing upwards and downwards on the top and bottom panels, respectively, of Axiom’s QS4 and QS8 surround speakers. Then he used a pair of tweeters firing at 45-degree angles, on angled portions of the speaker baffle. The result is a multidirectional-radiating surround speaker firing in four different directions (hence the moniker "quadpolar"). However, in the Axiom design, all drivers operate in phase. 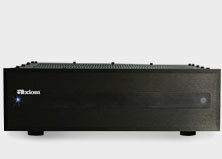 When this speaker is side-wall mounted, the net effect is both an ambient wash of atmospheric sound that mimics what’s heard in large cinemas, coupled with higher-frequency directional acuity provided by each QS speaker’s dual tweeters firing at diagonal angles across the listening area. In many applications, this is an ideal state of affairs, because it preserves ambient and directional effects for Dolby Digital/dts movie soundtrack playback while yielding fairly precise directional information for multichannel DVD-Audio or Super Audio CD (SACD) music listening, with an added ambient component to enhance musical "hall" sound. One driver is out of phase with the other. This means that when one cone moves outward, it compresses the air molecules, while the other cone moves inward, resulting in a rarefaction or expansion of air molecules.These opposing bass waves cancel at the sides of the speaker, producing a "null" in the listening area (to the sides), whereas the midrange and treble sounds fire forward and to the rear, resulting in a reflected and ambient wash of sound much like that heard in a big movie auditorium. Because of these qualities, dipole surrounds have become standard features of small mixing studios where movie soundtracks are assembled, because they imitate the wash of ambient sounds heard in a large auditorium. 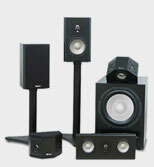 Each of these approaches to surround speaker design can be quite effective, and differences are quite subtle. In some large reflective rooms, even multiple direct-radiating surrounds can be quite involving. But for versatility and ease of placement in conventional or asymmetrical setups, in my experience, the quadpolar design has decided advantages.